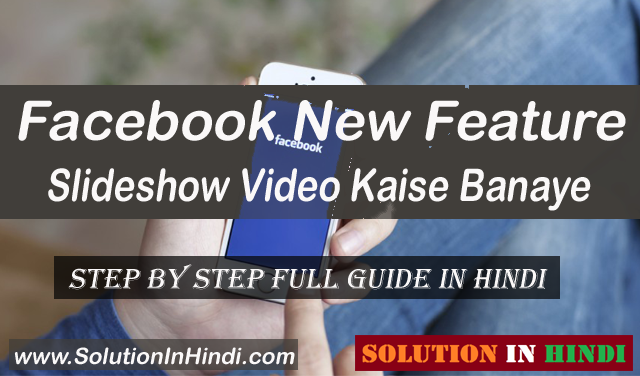 Facebook New Feature Slideshow Video Kaise Banaye Create Kare. Jee-Haan Dosto Aaj Ham Janenge Facebook New Feature Slideshow Kya Hai? Our Photo Ke Sath Facebook Slideshow Video Kaise Create Kare. Is Post Se Aapko Slideshow Feature Ki Puri Jankari Hindi Me Mil Jayenge. Dosto Slideshow Facebook New Feature Hai. Jo Latest Facebook Me Add Kya Gaye Hai. Or Ye Kafi Maze dar Hai. Yedi Aap Ads Video Create Karna Chahte Hai. Toh Apke Liye Bhut Hi Helpful Hoga. Kyu Ki Slideshow Ke Madad se Bhut Hi Easily Aap Photos (Images) Ko Video Me Convert Karke. Apke Sabhi (All) Friends Ke Sath Slideshow Video Facebook Timeline Me Share Kar Sakte Hai. Agar Aap Video Editing Ya YouTube Me Video Upload Karte Hai. Toh Apne Slideshow Ke Name Pehle Sune Honge. Kyu Ki Slideshow Feature YouTube Me Bhi Diye Gaye Hai. Or Iska Fayde Bhi Bhut Sare Friends Utha Rahe Hai. Dosto Agar Aap Mobile Se Viva Video Editor App Ke Madad Se Video Editing Ya Slideshow Video Create Karte Hai, Ya Editing Me Interesting Rakhte Hai. Toh Slideshow Ke Bare Me Thoda Bhut Ya Achchi Tarah Se Jante Honge. Phir Bhi Me Thoda Bata Deta Hu Taki Jo New Smartphones User Hai Usse Help Ho. Toh Chale Facebook Slideshow Video Maker Ke Bare Me Jante Hai. Facebook Slideshow Video Maker Kya Hai? Dosto FB Slideshow Ke Madad Se Aap Kisi Photos Ko Video Me Badad Sakte Hai. Matlab Apke Kuch Photos Ko Select Karke Ek Video Clip (Album) Create Kar Sakte Hai. Facebook Slideshow Feature Se Aap Music Bhi Set Kar Sakte Hai. Slideshow Video Etitor App (Software) Apko Paly Store Me Bhut Mil Jayega. Facebook Me Slideshow Feature Is Liye Diye Gaye Hai. Taki Facebook Use Ko Smartphones Me Other Koy Video Editor App (Software) Slideshow Video Maker Ke Liye Install Karna Na Padhe. I hope ab Apko Facebook Slideshow Ke bare me pata chala Gaye Honge Ke Slideshow Kya Hai. Toh Chale Jante Hai. How To Create A Facebook Slideshow Video In Hindi. Dosto FB Se Slideshow Video Create Karna Bhut Hi Easy hai. Apko bas Niche Diye Gaye Step Ko Follow karna Hai. Sabse Pehle Facebook App Open Kare. Agar Apke Mobile Me Facebook Browser Nhi Hai, Toh Yaha Facebook Par Click Karke Install kare. Facebook App Open Kar Liye Hai, Toh Apke Facebook Account Login Kare. Now Uper What’s on your mind? (Status) Writing Karne Ki Place (Jagah) Me Click Kare. Click Karte Hi Apke Samne Niche Kuch Option Hoga Jaise- Photo/Video, Go Live, Check In, Feeling/Activity, Yaha Slideshow Par Click Kare. Slideshow Par Click Karne Ke Bad ADD PHOTOS Par Click Kare. Ab Apke Samne Apke Photo Gallery Open Hoga, Kam Se Kam (At Least) 3 Photos Select Kare. MUSIC Ki Option Par Click Karke Music Choose Kare. Ab TITLE Par Click Karke Video Ki Title Name Kuch Bhi De Sakte Hai. Title Dene Ke Bad Upper Right Side Me NEXT Par Click Kare. Next Par Click Karte Hi Slideshow Video Create Hona Start Ho Jayega. Slideshow Video Create Ho Gaye Hai Toh POST Par Click Kare. Done! Facebook Slideshow Video Successfully Create Hoke FB Par Publish Ho Chuka Hai. Agar Apke Facebook App Me Slideshow Show Nhi Karrahe Hai. Toh Facebook App Ko Update Kare, Kyu Ki Slideshow Recently Add Kiye Gaye Feature Hai. Facebook Slideshow Video Create Karne Ka Tarika. Ab Aap Jangaye Honge, So Agar Apko Kisi Step Me Samajh Me Nhi Aaye Toh Comments Karke Jarur Bataye. Apne Friends Ke Sath Social Media Me Share Kare. Taki Apke Friends Ko Bhi Pata Chale. Or Haan Facebook New Feature Slideshow Use Karne Me Kaise Lag Raha Hai, Hame Jarur Bataye. Computer, Mobile, Earn Money, Social Media, Facebook, YouTube, WhatsAap, & Internet Ki Puri Jankari Hindi Me Sikhte Rahe Or Dusre Ko Bhi Sikhate Rahe www.solutioninhindi.com Ke Sath Update Rahne Ke Liye Subscribe Kare. And Other Social Site Link Niche Hai. Wow… Yr. Maine v slideshow banaya…. Facebook New Feature Slideshow Is So Helpful For Ads, Album Maker, So Fun. Thanks For Sharing This Tricks. Facebook Post Par Backgroud Color Kaise Change Kare.? Fun Karte Rahe Or Solution In Hindi Ko Bhi Na Bhule.. Helpful Post Dekhte Hi Apne Friends Ke Sath Share Kare Taki Apke Friends Ko Bhi Help Ho.. Thank You. Thank You And Visit Again..! Apne Mera Question Ka Jawab Nhi Diye Hai. Kya FB post ke background color set Kar Sakte Hai. Mera mobile me background colour show nhi karraha Hai. Facebook Par me Ek post Dekha Jo photo Ke Tarah Lag Raha Tha Par woh photo nhi Hai. Usko pucha Toh woh background color bola. Kaise Karte Hai nhi Bataye. So plz help me. Details SE post Kare Ya Phir Mujhe FB Ya Gmail Kare. OK Tension Ki Koy Baat Nhi Hai. Actually Background Color Feature Sabhi Mobile Me Support Nhi Karta. Uske Liye Apko PC ki jaruraat Hai.. Aaj Sam Ya Phir Kal Subeh Tak Details SE Post Kar Dunga Taki Sabhi Friends Ka Help Ho OK..